Here's my dilemma: I found a Rudsak coat on sale (now priced at $249, down from $499) which is available in either winter white/light beige or solid black - and I can't decide on the colour to buy or on whether I should buy both. Both the winter white/light beige and the black coats are exactly the same cut & style - except for the colour. The coat is identical in styling, but made of wool & leather instead of the shiny satin you see in the picture. My question is: are winter white/light beige coats just as timeless and versatile as the black colour? Or might this light beige colour be dated & impossible to keep clean. I'm drawn to the black colour over the beige, but I have to admit that the beige is striking and unique. 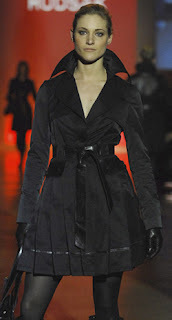 I already have a black coat, but adore black, and will always find a use for it. Should I just bite the bullet and buy both the winter white and the black coats in exactly the same style? I'm very petite, and asian with long dark hair and dark colouring if it helps. I also wear a lot of true white & black in my daily style. I noticed that the light beige coat is almost the same colour as my skin! I'm afraid that this will wash me out, and make my black hair stand out (in a bad way) and look out of place. But at the same time, I'm afraid that the black coat will be too darkening with my long dark hair, small frame & olive skin. Oh what to do! Help! the coat is beautiful, so you should definitely get one. And if I have to pick one, I'll pick the black one. The reason being that since you raise some concerns about the lighter coat being too similar to your skin color, it might not be a good choice for you. With this said, I hate to let go of a good deal on such a beautiful item (the light one). This beige coat, in fact, could also become a staple of your wardrobe, as I believe that coats, especially in such neutral colors, will never go out of style. Granted, a black coat is much easier to wear. And since I also have a habit of buying the same item (if I love it) in different colors, I am all for you buying both coats, if you so decide in the end. I have a pair of boots by Aldo in brown suede that I love, so imagine how quickly I pulled out the wallet when I found the same pair in black leather! 1. If you only buy one coat get the black one. I think it will look great on you. 2. If you really want the beige one too (and can afford to buy both), go back to the store and try it on again. Then look at yourself in the mirror and see if it really makes you wash out. I am thinking that your dark hair should pop nicely against the lighter color, but the skin color could be tricky. So if you still have doubts, don't buy it. Or, if you can, take a picture and send it over!